Hi crafty people! 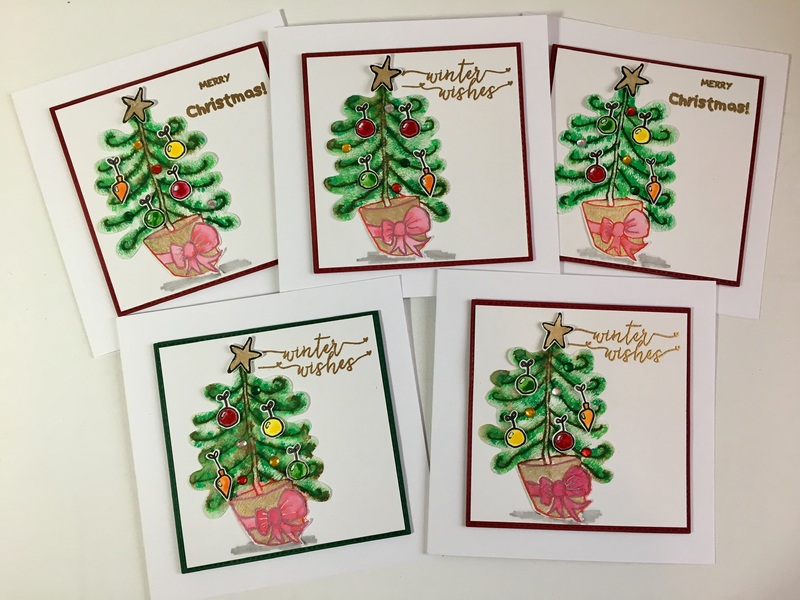 Today we are going to be making 5 cards using the Mama Makes Sarah Jumbo stamps – A Christmas journey. 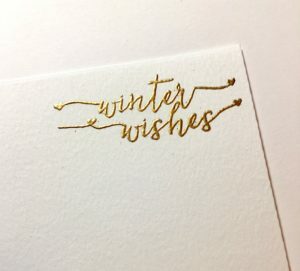 I thought I’d show how quick and simple it is to make a few cards at once, esp with Christmas coming up. 1. 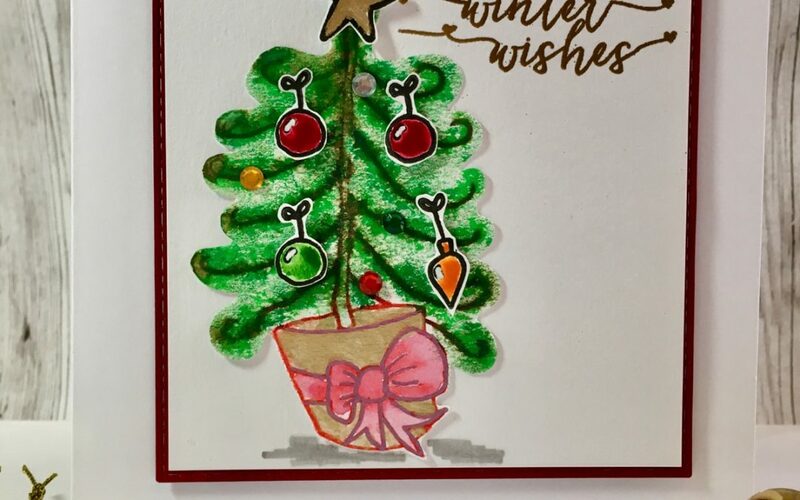 I stamped my tree in two different colours. Brown for the tree and red for the pot. To make this easier I used a stamp platform, that way I could do one colour at a time. 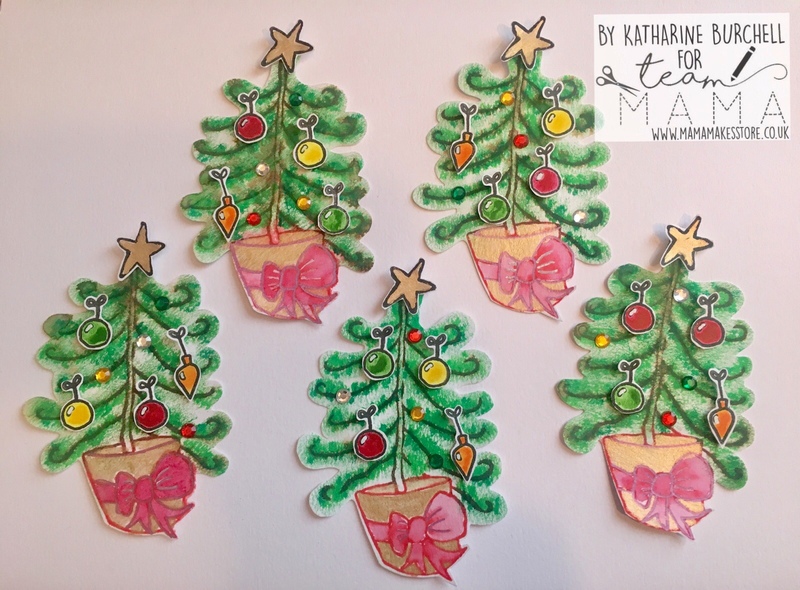 I stamped out my 5 trees out onto my card. 2. Using the green gelatos I went over the branches with the dark green and then over with the lighter green. I smudged them together and then sprayed them with a bit of water to set them. I then painted the pot in gold and the bow in red. 3. Whilst the trees where drying I stamped out the baubles in black versa ink. I painted them in green, red and orange. 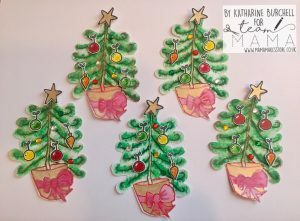 I made 4 decorations for each tree. Plus 5 stars painted in gold paint too. 4. Carefully cut all your trees and baubles out! I placed 3D foam under the baubles and stars to add height and some gems to add gems. 5. Die cut 5 coloured squares and 5 white card squares in the same size. On my dies I have stitched pattern which I cut off the white card, so it fitted perfectly mounted on the red/ green card. 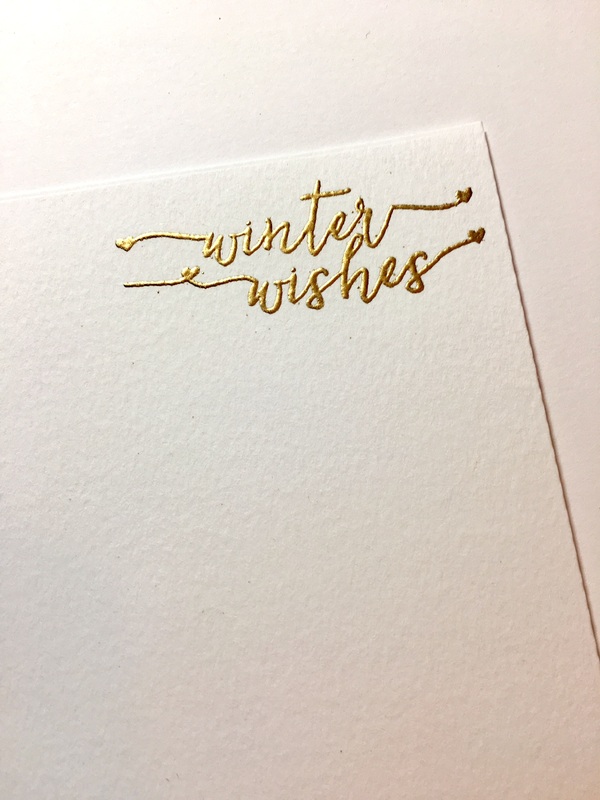 Before sticking the card together I stamped and embossed winter wishes in the right hand corner. 6. Position where you’d like you Christmas trees, without sticking it down yet and add some grey colouring to make it look like a shadow under the pot. Stick your trees on! 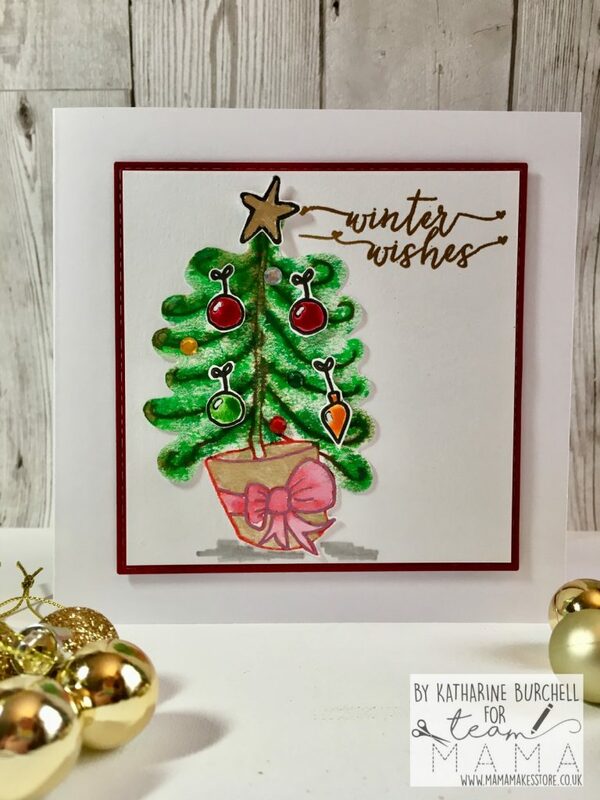 Add some 3D foam to the back of the coloured card and adhere to your square blank. 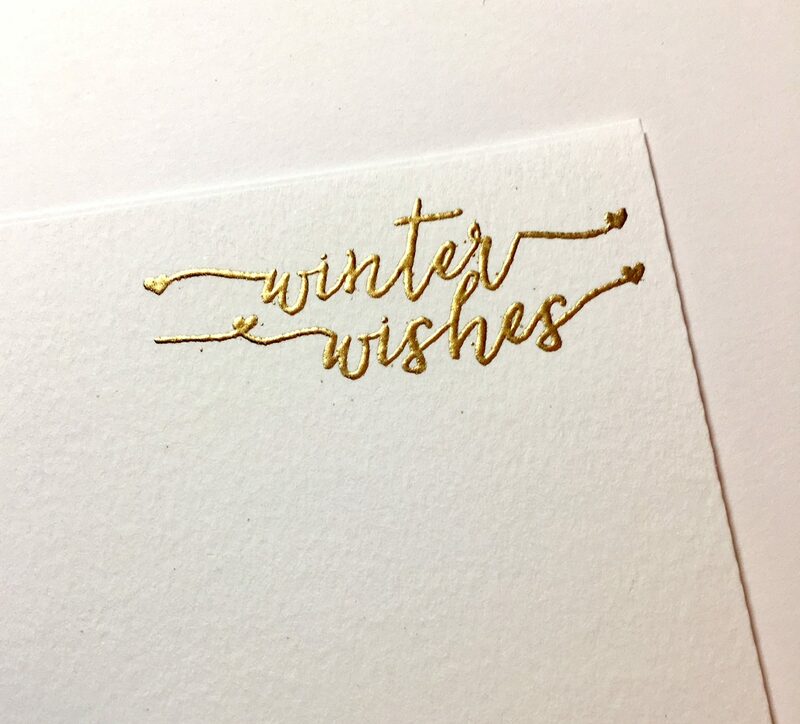 Hope you like this tutorial and hopefully you’ll have your Christmas card made in no time!